We own, breed, raise, train, show, hunt and participate in AKC events with our Nova Scotia Duck Tolling Retrievers. They live with us in our home. They are more than a pet. Our Hunting Retrievers are our companions and man’s Best Friend. 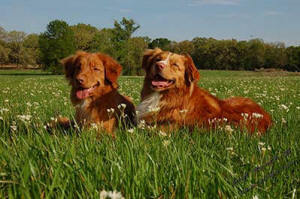 Nova Scotia Duck Tolling Retrievers have been referred to as “Living decoys”. As hunters we use the tolling of the Toller to lure ducks within gun range. We are two people who love dogs. We have had dogs around all our ives, but never really “trained” or hunted with a “trained” dog until about 5 years ago. We became more involved with our local retriever club, Bryan-College Station Retriever Club. As Toller owners we are associated with Nova Scotia Duck Tolling Retriever Club-USA and both the American Kennel Cluband the Hunting Retriever Club/United Kennel Club, and help when our local club hosts annual hunting tests under the regulations of these organizations. We own Tollers and we love them. Our Tollers are house dogs. Do not misunderstand, they are working dogs and do occasionally stay in kennels, but they live with us. Somewhere along they way from researching and purchasing a Toller and hunting, we got caught up in this group, figuring that somebody probably knew a little bit more about making that puppy sit and stay than we did. Surely someone in a retriever club and the Toller club knew how to make a Toller into a great companion and hunting partner. And possibly someone in this group knew where the ducks and geese were landing, and could take us out hunting some winter morning. And maybe, if we were lucky, we could make some friends who would share some shells, some hot coffee, some goose gumbo, some training tips, and some tall tales. Just a little info on Celia and Max. Celia’s family home is Madisonville. She went to school in Navasota, Texas and finished High School at Westbury in Houston. Max grew up in Silverton, Texas and then Texas A & M, Class of ’74. We have three children, all married, and two grandchildren. Some of our interest include travel, cooking and eating, hunting, fishing and Tollers. We have tried to learn as much as possible about the Tollers and training of the little red dog. We have tried to do as much training as possible on our own. However, we are not professional trainers! We have learned from several sources from our club and Toller owners. We own two Zinger Wingers to throw birds. These were purchased to save our marriage. Here are a few of the resources we used.